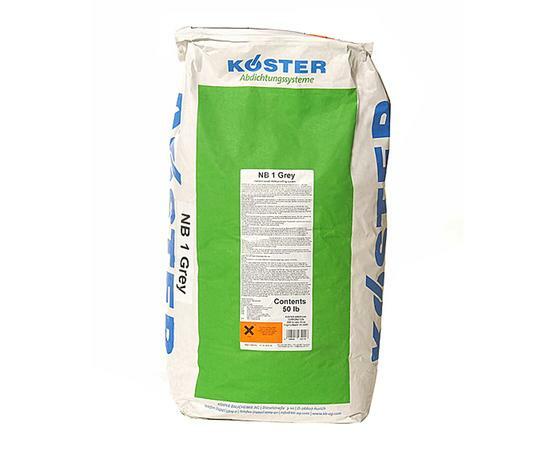 KÖSTER NB1 Grey is a BBA certified mineral waterproofing slurry system containing crystallising and capillary-plugging agents for sealing against pressurised water. It can be used for waterproofing against ground moisture, non-pressurised and pressurised water in new buildings and restoration. It has a watertight (>130 m water head), mineral surface coating with subsequently crystallising agents. Waterproofing undertaken with KÖSTER NB 1 Grey is characterised by excellent resistance to pressure and abrasion as well as excellent resistance to chemicals. Waterproofing with KÖSTER NB 1 Grey should only be carried out on substrates that are free of moving cracks. The addition of KÖSTER SB-Bonding Emulsion to the mixing water or respectively the use of KÖSTER NB 1 Flex raises the ability of the material to retain water and prevents, in cases of unfavourable weather conditions (warm, dry, drought), a premature curing of the coating. KÖSTER SB-Bonding Emulsion also introduces flexibility to the material. KÖSTER NB 1 Grey is approved by the building authorities and tested in accordance to the potable water guidelines.